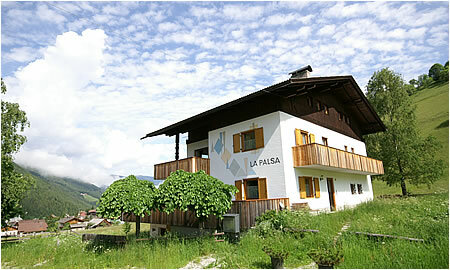 The apartments La Palsa welcome you in different apartments suitable from 2 to 8 guests. The house is located in a very peaceful area and is not for from the village centre. You can reach the slopes on foot - it will take you about 10 minutes or you can use the skibus passing nearby at 70 metres. The apartments are tastefully furnished and provided with a fully equipped kitchen, living room, 3 bedrooms and 2 bathrooms, TV, balcony, all laundry and washing machine. There is a garden and a carpark by the house.